The Caregiver Program is a 4 week program of full time instruction with a total of 112 clock hours. The program trains students how to safely assist residents within the assisted living facility or within their own home. This training includes instruction on how to bathe, ambulate, transfer, perform oral hygiene, assist with dressing & assist with eating. Students will also learn how to administer medications safely and respond appropriately to emergencies. This program is licensed by the Arizona State Board of Examiners of Nursing Care Institution Administrators and Assisted Living Facility Managers. Students will test for the Arizona State Board of Examiners of Nursing Care Institution Administrators and Assisted Living Facility Managers certification. 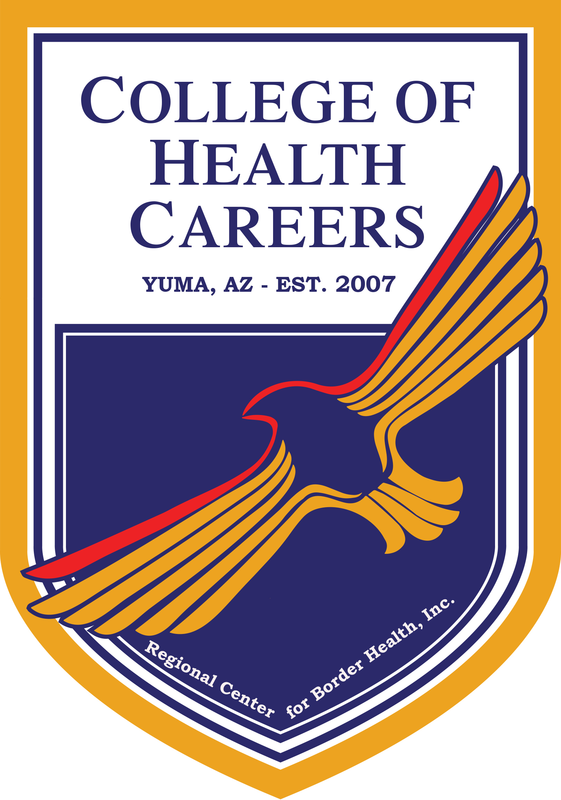 Students will be provided an overall orientation of Regional Center for Border Health, Inc./College of Health Careers and complete required student file forms. During this orientation, students will be provided ways to study, how the courses will be presented and what testing procedures will be performed. Medical library resources, both local and offsite print & web based resources, are introduced. Students will be required to use these resources during the program for research. A program pre-test will be given which is not applied to the program score. These are utilized to evaluate the quality of the program. Home Care & Healthcare Systems introduces students to the world of healthcare in a 2 hour short course. In this course the students learn about various types of healthcare facilities/organizations. Students learn what the “scope of practice” & how it will relate to their practice. An introduction to state & federal regulations is reviewed, along with specific state & federal departments. Legal & Ethical Issues encourages students to explore their own morality & apply that to the workplace. Emphasis is placed on the legality of an action along with the ethical dilemmas that may occur. This course will be full of open discussion with the instructor for 5 hours. Communication & Interpersonal skills are required to be practiced in the job setting. During the 4 hours of this class students will explore appropriate communication with their peers & how this will relate to the client. Understanding verbal & non-verbal communication is an important skill the caregiver needs to gain the trust of the client. Infection control explains the way infections get passed from one person to another. During the 5 hour lecture portion, students will be shown the basics of sanitation, disinfection & sterilization. During the 4 hours of laboratory practice, students will demonstrate hand washing, sanitation & disinfection of surfaces. Safety concepts are important to prevent injuries in the workplace. Body mechanics, posture, body alignment & other concepts are discussed in the 5 hour lecture. Students will then practice skills learned. Students will be taught & certified in cardiopulmonary resuscitation. During this 2 hour lecture, students are given an overview of the anatomy & physiology of the human body. The Holistic concept is introduced which will encourage the caregiver to look at “the whole person” when assessing for changes. Students will receive 6 hours of instruction on proper nutrition & physical nutritional needs. Caregivers will be working with clients that may have specific nutritional needs & will gain an understanding of the reasons why the client’s needs are different from general nutrition. This portion of the program consists of 17 hours lecture & 10 hours of laboratory practice. During the course, students will gain an understanding of how clients will be taken care of. Specific skills will be taught & return demonstrated by the student. A few of these skills include transferring a client, feeding a dysphasic client, assisting with housekeeping chores and many others. Medication Administration within a healthcare facility is a skill that requires specialized training. During the 16 hours of lecture & 6 hours of lab practice students will learn about medications & how they are distributed. Students learn about various classes of medications, what common side effects are, what an “adverse reaction” is & how to manage this. Students also are taught how to practice “resident’s rights” regarding medications. Other medication topics are covered as well. Mental illness is full of myths & fallacies. During the 15 hour lecture, students are taught the differences between fact & fantasy. Students learn about physical wellness & how mental health problems could affect this. Students are taught how to deal with the cognitively impaired client appropriately. Students are provided 5 hours of lecture regarding basic housekeeping skills, basic maintenance techniques & how to develop cleaning schedules. Students are provided 4 hours of lecture about the importance of the Service Plan. How a Service Plan is developed is discussed, how the interventions listed are implemented & how the caregiver is able to notify their supervisor for needed adjustments to the Service Plan. Students are provided 4 hours of lecture regarding their new career. Resume writing, job searches, different ways to manage stress & money are discussed. Students are encouraged to create a resume & develop a job search plan.